With a new sneak peek into what will be onboard Mardi Gras, we’re defining exactly what we know about the ship thus far. Though itineraries won’t be announced until January 2019, the new game-changing roller coaster tells us a lot about what we can expect to see on this ship: Carnival fun, but bigger and better than ever before. Just when you think you’ve seen it all, Carnival changes the game once again. Upon debut in 2020, Mardi Gras will be the first-ever cruise ship to feature a roller coaster. Traveling up to 40 mph, the passenger-controlled vehicles on “Bolt: The Ultimate Sea Coaster” will ride along an 800-foot track that sits 187 feet above sea level. The twists, turns, and drops of the track will wrap around the ship – including the iconic Carnival funnel. There will even be a camera ready to snap photos of your ride, just like at a theme park! The name Mardi Gras honors the ship where the fun first began. The original Mardi Gras, which made its Carnival debut in 1972, was marketed as “27,000 tons of fun.” At more than 180,000 tons, the new Mardi Gras will be the largest-ever ship to join the Carnival fleet, marking a nearly 50,000-ton increase over even the latest Vista-class ships. That means more room for more fun. As the future of cruising continues to turn greener, Mardi Gras will be the first North American-based cruise ship to be powered by liquefied natural gas (LNG). Although LNG is the cleanest burning fossil fuel, its expensive production and storage mean it’s only just now becoming commercially available to cruise ships. Not typically one for using hull designs on its ships, Carnival is shaking things up for its XL class. Mardi Gras will feature navy-blue hull art accented with red and white to reflect the Carnival’s infamous colors, celebrate the company’s legacy as America’s Cruise Line, and pay homage to maritime traditions. Sleek, simple, and powerful, the new design marks a change for the line much in the same way Mardi Gras itself is taking the cruise line in a new direction. Upon its debut in 2020, Mardi Gras is set to homeport in Port Canaveral, Florida. 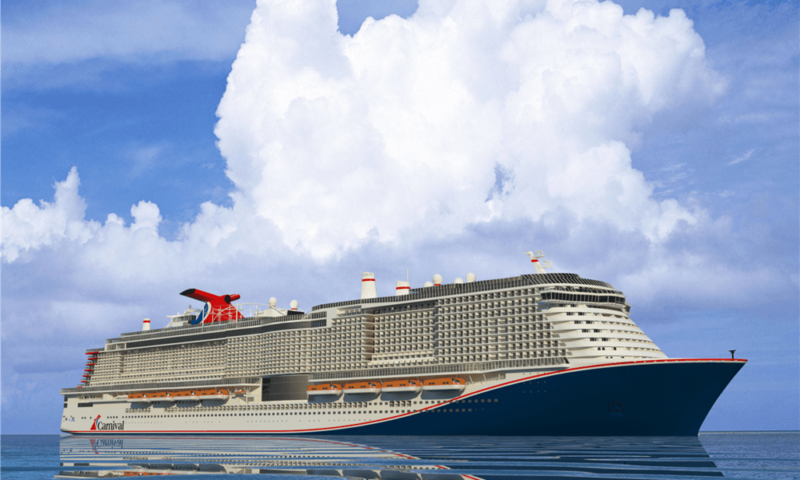 Meanwhile, Carnival is investing $150 million into Port Canaveral to build a new terminal that is set to be completed in June 2020 – just in time to welcome the mega-ship Mardi Gras. The new terminal will have a futuristic design inspired by the nearby Kennedy Space Center, as well as two passenger boarding bridges and a parking garage (in anticipation of the extra capacity needed to host the 6,500-passenger XL-class ships).